How many eggs do Amish eat? How much do they can? How often do Amish order pizza or other food to the home? Authors David McConnell and Marilyn Loveless include a survey revealing interesting points about the Amish diet. They compared the four major affiliations of Amish in the Holmes County community (Old Order, New Order, Andy Weaver, Swartzentruber) and non-Amish households in the same area. We’ll have an interview with David and Marilyn soon. In the meantime, here are 5 interesting things the authors discovered about the Amish diet and food habits. 1. 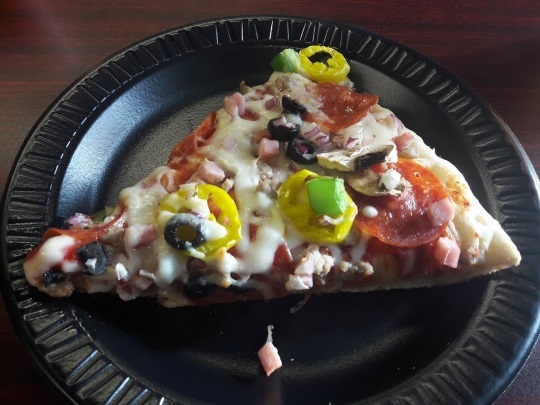 Amish order pizza and other delivery food more than you think – According to the survey, Amish order pizza and other home-delivered meals about twice as often as non-Amish. This varies a lot across the different groups however. The Old Order Amish affiliation order delivery about 10 times as often as the very traditional Swartzentruber Amish. On the other hand, non-Amish eat out a lot more than Amish (over 6 times as often). Getting a meal delivered can be especially convenient when you rely on the buggy, or expensive taxi travel to go any real distance. 2. Amish can – a lot – That Amish can is hardly a surprise. But they can things you might not think of as traditional canned goods – including a wide variety of meat, and even pineapple. Amish typically grow the vegetables they can, but usually buy the fruits. Meats they can include hamburger, chicken, venison, trail bologna, and meatballs. 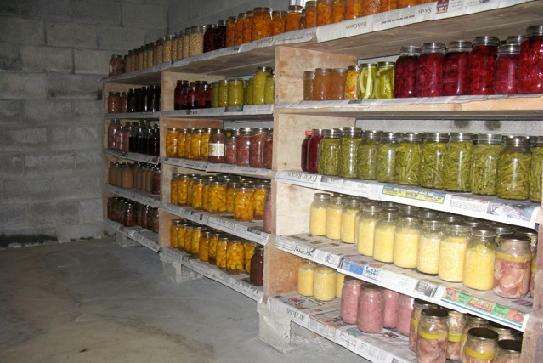 For some examples, here are photos of canned goods in the basement of an Amish family of 11. 3. Swartzentruber Amish gardens are 7 times larger than other Amish gardens – This suggests that the Swartzentruber Amish, the plainest group in the survey, are in this sense more self-sufficient than other Amish. 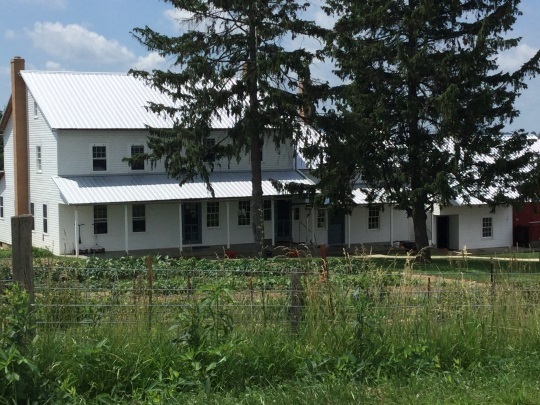 With their large gardens, Swartzentruber Amish unsurprisingly also can over twice as much as other Amish. 4. 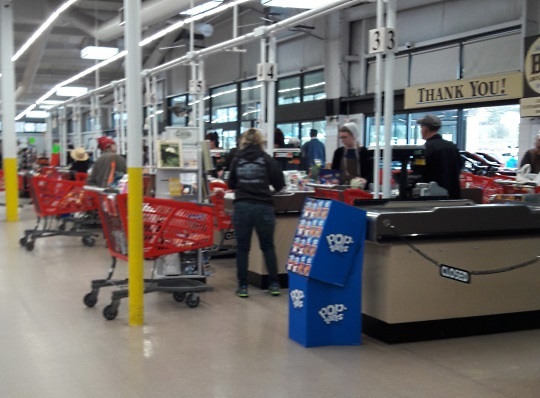 Amish eat junk food too – Though their reliance on homegrown foods surpasses that of the English, Amish do not grow, raise or hunt everything they eat. And this means they also bring home junk food, like potato chips, cupcakes and soda. But do they eat as unhealthily as the average non-Amish person? This quote might reflect this woman’s concern about changing diets in her community. 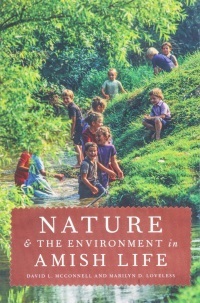 Still, the idea that Amish eat a pristine, all-natural diet is fiction. 5. Swartzentruber Amish eat a load of eggs – The Swartzentruber families in the survey averaged a whopping 12+ eggs per person, per week. Other Amish ate less than half that, around 5 or 6 per person/week, and English fewer still, at around 4. I don’t know what this says about their cholesterol levels, but expect to see a lot of chickens milling about if you visit a Swartzentruber farm. Bonus Fact: A grand total of zero of the 150+ Amish families surveyed by the authors were vegetarian. What other things have surprised you about the Amish diet and food? I am surprised at how often the Amish order in pizza! We don’t eat out and we don’t order in. I suppose it has to do with the amount of disposable or discretionary income we have. We didn’t buy much junk food for our children either. We might have had chips and pop at Christmas. But now, chips are too salty, pop is too sweet, and they are all too expensive. One of the points the authors suggest is that changes in diet among the Amish are tied to the rise of small business culture in their communities. It seems that lower prevalence of a farming lifestyle and more discretionary income point them in this convenience food direction. The two of us normally eat 3 eggs per day for breakfast, so we purchase around two dozen eggs a week. So Osiah sounds like you are right about Swartzentruber egg level, not bad:) I would eat them more if I was better at preparing them. Something about eggs, they always seem to taste better to me when someone else makes them. Every time we visit our Old Order Amish friend in Lancaster, we usually drive him wherever he needs/wants to go. We always take him to the bank and then next door to the bank is a McDonald’s. I can’t tell you how disappointed he was when he found out that the milkshake machine was broken that day! He was able to get his Big Mac, but he definitely wanted that milkshake too. I asked him if he goes to McDonald’s a lot and he said he does go there whenever he is in that part of town on his horse and buggy. I also find it funny that with all of those great bakeries in the area, he buys boxes of Entenmann’s donuts. The Amish are interesting in many ways! Although, I should state that he is an older (in his seventies) Amish man who never married. So, he doesn’t have an Amish wife to cook for him. He lives in the dawdi house on the family property and though his nephew and their wives are there, he is very funny about not imposing on any of them. WHat I always look at as a treat, eating out, is not so for my Amish friends. To much hassle and possibly being uncomfortable around so many English. Our favorite meal at their house, in fact, it is the meal their newly married daughter asked me to cook for the wedding day evening meal, was grilled pork chops. I can’t tell you how my heart swelled when she called me to ask me to cook for her!! The wedding was in November, and the daughter called me last week to tell me that there was a new baby on the way! That news was almost as good as the news that I was having my own grandchild! Some of the best friends a person could ask for. Order pizza without a telephone? They do have telephones, just usually not in the house. Many of them also have cell phones. Some choose to be more obvious about that fact; some more so secretive. Right smartphones are also found in some communities. Maybe Uber Eats or other food delivery apps are being used here as well, I do not know. Some Amish are using the convenience of the regular Uber app rather than having to arrange an Amish taxi in advance, so ordering food with the spin-off app doesn’t seem far-fetched. This is correct, phones are typically in a small building called a phone shanty or phone shack. The building itself might be as close as the backyard or as far as a quarter mile or so down the lane, and shared with other families. Some Amish will also have phones in barns or shop buildings. I live in Ohio and some do have cell phones. Erik, this is a dead-on correct artical as far as upstate New York Amish live and eat; Swartzentruber Amish not withstanding. What is vividly observed is here is that Amish work very hard to survive in this area. They are more spread out here, come from different Amiah orders, and have less support. So they cut a lot of corners. For example, if they sell out of eggs they go without. You wouldn’t believe all the grocery canned food they eat — everything from spam to soup, from stew to meat. They make and sell a lot of their garden fresh jared and canned goods like jellies, pickled eggs, relishes, soups, meats, etc. to tourists all spring, summer, and fall l- “it’s for tourists” and represents a big part of their income. So Amish in this area love Walmart, and they eat these products saving their best for sale. I can honestly state their diets are subpar in this region for the most part; something that over a doxen years ago came as a shock to me. Almost every barn here now has a cell phone, and Swartzentruber Amish borrow them or use the shanty. Here, if take-out is willing to drive out [and some are not] they order pizza and Chinese food. Indeed the times they are a changing! Observations like yours really put the lie to the idea that the Amish universally eat a “healthy and all-natural” diet. I do know Amish who are very health-conscious about their diets, and I think some of that comes from the influence of organic farming and the health emphasis that surrounds that market. Swartzentruber Amish tend to have quite low income, and everyone has some weakness for junk food (which is often cheaper in cost to begin with). And our dietary habits are typically passed down from parents, we tend to eat and like the things we ate growing up, so those habits remain. So with the Amish and diet it is definitely a mixed bag as the examples you’ve seen have shown. Btw Maureen, with your experience in the area I thought it might be interesting to get your insights in a possible guest post. If you want to touch base on the idea just ping me an email (ewesner(at)gmail.com). Erik, I gave you a ping at the e-mail provided. Thank you. 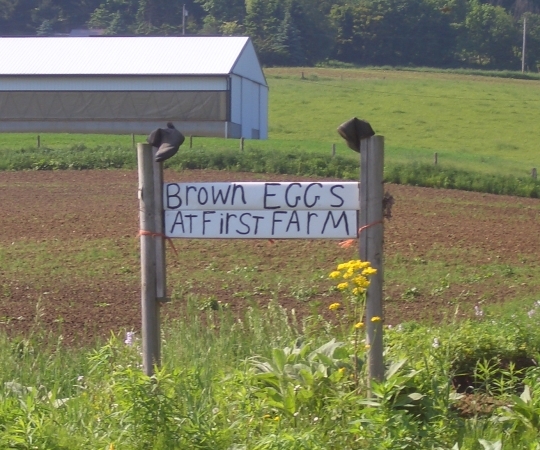 Couldn’t help but notice the boots on top of the eggs for sale sign. Unless I’m missing a meaning behind them being there….such as meaning “We’re Open.” Interesting place to dry them out. But if it works, go for it. Those caught my eye too when I took the shot way back when. I am not aware of any boot or shoe code that indicates whether a place is open, but I like the way you’re thinking;). My guess would be attention-getters. What is Amish Funeral Pie? Do Amish eat at McDonald’s? Which is the best Amish baked good?